Chairperson of the National Electoral Commission, Mohamed N’fah Alie Conteh, yesterday announced the final result of the March 7 presidential election, but any of the sixteen political parties, including the two major parties, could not reach the threshold of fifty-five percent to clinch the presidency. According to the final result read by the NEC Chairperson and Chief Electoral Officer, presidential candidate of the main opposition Sierra Leone Peoples Party (SLPP), Retired Brigadier Julius Maada Bio, was placed in first position with 43.3 percent, followed by the presidential candidate of the ruling All Peoples Congress (APC), Dr. Samura Matthew Wilson Kamara, who secured 42.7 percent. 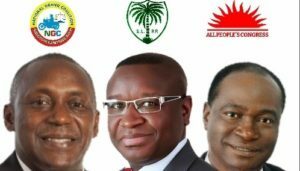 Dr. Kandeh Kolleh Yumkella of the National Grand Coalition is in third position with 6.9 percent, while Chief Alhaji Samuel Sam-Sumana secured fourth position with 3.5 percent. After reading the final result at NEC headquarters in Freetown, Mohamed N’fa Alie Conteh noted that since none of the political parties could not reach the threshold of 55 percent, there would be a run-off between the SLPP’s Retired Brigadier Julius Bio and Dr. Samura Kamara of the ruling APC. Conteh told the public that results from 221 polling stations across the country were excluded in the final results due to over-voting and other electoral malpractices, although he didn’t specify the areas where the said nullification was effected. Overall, there were 3,178,663 registered voters, but according to the NEC chairperson 2,537,122 valid votes were recorded with 139,427 invalid votes. The announcement of a run-off by the NEC chairperson did not come as a surprise to many. The National Elections Watch had in their preliminary report indicated that there would be a possible run-off, albeit the said claim was challenged by many. While the two major parties tightly competed in the first poll, their possible option remains to coalesce with the two minor political parties – NGC and C4C – who both secured a little over 10.4 percent of votes in the March 7 presidential election. It will be in Sierra Leone’s National Interests for NGC and all the other contestant-parties not to go into coalition with either SLPP or APC – because of their known history and reputations – but to stay in opposition to effectively expose wrongdoings. NGC must for the sake of “progress” accept this defeat and commence appraisals of options for improvements – strategies, policies, and practices – needed to succeed next time because SLPP and APC are most unlikely to change; both have too many skeletons in too many cupboards!